Last year, our friend Todd O’Reilly pedalled 1,500km with his 13-year-old son Daegan in a 25-day charity ride, from Toronto to Ottawa, to Montreal and then ending in New York City. But instead of asking for donations for his charity, Todd had the brilliant idea to have people pledge an act of kindness for his 500 Kindnesses (http://www.500kindnesses.com) campaign. 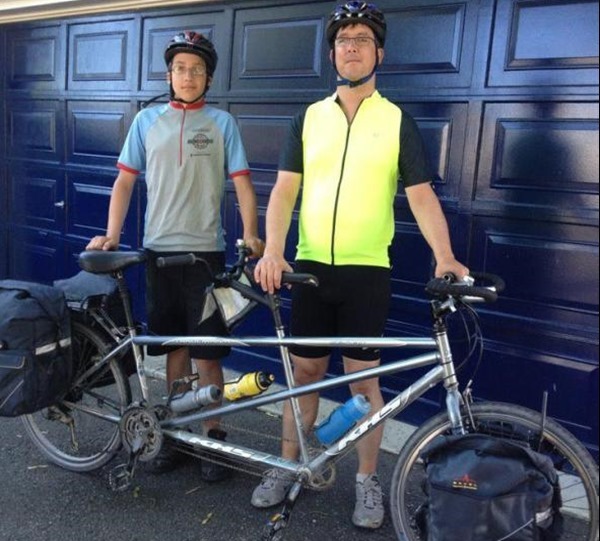 Todd would like to do another ride this year with his son, but he needs help to find a tandem bicycle to replace the one he donated at the end of his trip last year. This year we are continuing the project and have raised 1,023 acts of kindness so far. We plan to ride again starting June 30. But we’re missing one important part. We’re looking for a new tandem bike to replace the one we donated. And we’d like your help. Tandem bicycles are not always easy to find, and come in differing sizes so not all of them will work for us – even the one we rode last summer would likely no longer fit Daegan who grew like a weed in the past year. Sturdy multi-speed tandem bike suitable for touring. That means at least 3 braze-ons for water bottle cages, and the ability to install front and rear racks. In good repair and of quality workmanship such that it is capable of doing 1,500-2,500 km with major failure unlikely. Daegan and I are both about 6 feet tall so both captain and stoker positions need to be large enough to accomodate us. Ideally the bike would be close enough to Toronto that we could get a good test ride in and easily get it back home to Toronto. All told, including any shipping (which we hopefully don’t have to deal with) we can spend about $2,500. So we’re asking you to keep your eyes open for us. Do you have a tandem bicycle in your garage that you haven’t used in a while? Does your neighbour? Do you have a friend who has one? Put us in touch and we’ll be eternally grateful. The Urban Country would be happy to donate $500 towards the cost of buying or refurbishing a tandem bicycle to help offset the costs for Todd. Please let Todd know if you can help him source a tandem bicycle. Or, if you haven’t already, please consider pledging an act of kindness. glamorously, conjointly in Villefranche-sur-Mer within the South of France. since the great news is that the yacht is out there to rent – at a hefty value.